Everyone loves the classic story, The Giving Tree by Shel Silverstein. This book is well known by children and adults alike. The beloved story is about love, friendship and, of course, giving. I came across this great idea via Ohdeedoh and loved it so much I sent it to two of my sisters, who are both teachers. 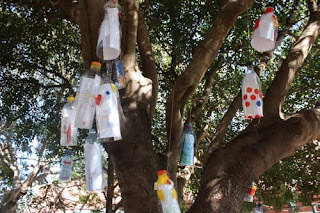 The basic idea is for each child to draw a picture of something they are thankful for, sealing it in a soda bottle and hanging it on a tree. Cute, right? I found the idea through Ohdeedoh but for the original post and step by step instructions go to Growing Up Creative. That was one of my favorite books growing up! What a lovely idea. That was one of my favorites as well and I look forward to reading it to my daughter. :) Thanks for commenting Ally! I feel honored that you check in on my blog. I'm still reading through all your amazing posts so I'm up-to-date on your blogging/traveling/moving adventures! Happy Blogging!